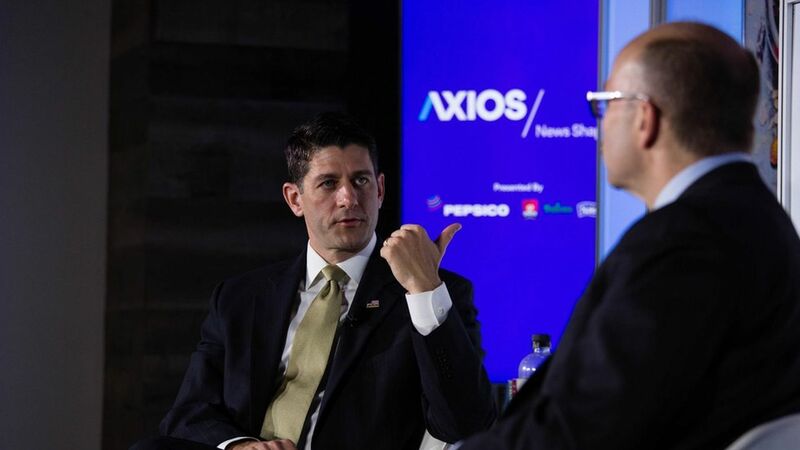 Mike Allen sat down with Speaker of the House Paul Ryan at this morning's Axios News Shapers event. Toplines: He says tax reform will get done in 2017, doesn't know the timing on infrastructure, disagrees with Trump on Comey and thinks the GOP can keep the House in 2018. Taking responsibility on health care: "I accept that we will get hit for this. We're in leadership, we don't have a choice, we're a majority...I just don't think from a moral standpoint that's something we can do. We have to intervene to fix this problem because real people are actually getting hurt." The AHCA vote: "I'm glad we went through it. It was very cathartic." His message to insurers: "My hope is that you stick it out in the marketplace so you're there to catch people when the help arrives which is a more helpful, more vibrant marketplace." His hope for health care: "Let's just buck up as a society and pay for the catastrophic illnesses." His takeaway from Trump's budget: "We have a president who, for the first time in 8 years, said, 'Let's actually balance the budget'…I think that's refreshing." Infrastructure: "I don't know what the timing of that will be for that as much because we've got to come up with the fiscal space." Border adjustment tax: "Full immediate border adjustment would be too disruptive — nobody's advocating for that." Branding Comey a "nut job": "Yeah, I don't agree with that. And he's not." Calling him a Boy Scout: "I took it as a compliment. I'm not sure it was meant that way. We're just different people." His best quality: "His best quality is his energy and his engagement...When he sees a goal he wants to achieve, health care is a perfect example, he just focuses on it. He has no pretension about him." How Americans perceive Congress: "They think that everything is in chaos. It really actually isn't. We're focused and determined to get our work done." The GOP's chances to keep the House: "I think they're excellent because we're in the midst of keeping our promises." Most inconvenient thing about being Speaker: "Time management. I'm taking my kids fishing this weekend, it's Memorial Day weekend, but I had to schedule that four months ago." 1 fun thing, GIPHYs in texts: "These things are awesome. I learned about this like three weeks ago….I send them to people who wouldn't expect them from me. I got one with Britney Spears doing this. These things are pretty damn funny."